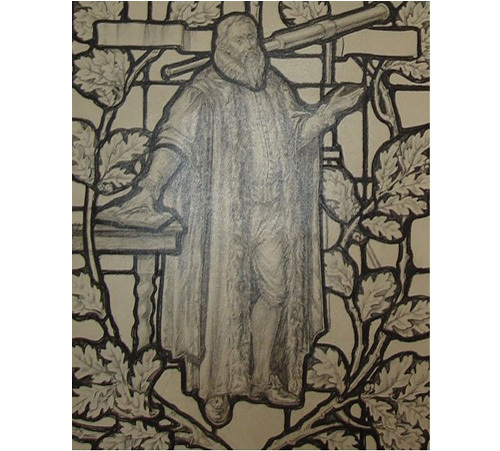 Jean Vaudeau, Senior Lecturer in Fine Art, took her inspiration from Florence Camm's design for a stained glass panel featuring the Italian astronomer Galileo Galilei that she found in the BIAD School of Art Archive. Florence Camm, Stained Glass design, c.1900, BIAD School of Art Archive. In 1609 Galileo constructed a telescope and applied it to making ground-breaking astronomical discoveries. His first observations were published in Sidereus Nuncius in 1610. Especially notable was his discovery of four of Jupiter's satellites, sunspots and the rings of Saturn. From 1613 until his death thirty years later he was in conflict with the Catholic Church because of his conviction that the earth moved around the sun. 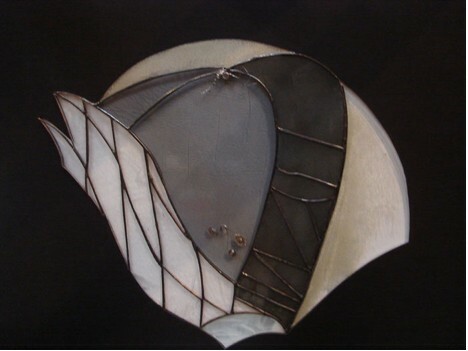 Jean Vaudeau's creation of an artwork in stained glass is informed by the life of Galileo, whose study of the sun may have caused his blindness in later years.